2015 was the year when Russia “discovered” Eurasia. Surprisingly, the continent that was the cradle of many ethnic groups and civilizations and the birthplace of great empires remained, until recently, on the periphery of Russian foreign policy perceptions. An explanation may be found in the fact that Eurasia, despite its unique history, was not regarded – again until very recently – as an integral political and economic entity. It was torn between Europe and Asia, lacked an image and a supranational identity of its own, and was perceived as a space where the leading regional powers, Russia and China, were locked in rivalry. Russia, China, and their regional partners managed to reverse these negative trends in the outgoing year. As early as May 8, one day before the Victory parade in Moscow, the Russian and PRC leaders signed a historic statement on the “pairing” of the Eurasian integration (EAEU) and the Silk Road Economic Belt. In turn, the leaders of the Eurasian Five (Armenia, Belarus, Kazakhstan, Kyrgyzstan, and Russia) confirmed at their October 16 summit in Astana, Kazakhstan their intention to cooperate with China and instructed the EAEU Commission to coordinate the actions of the various national governments. At the same time, relations between Russia and China acquired a fundamentally new quality. Their distinguishing features are mutual trust, consideration for each other’s interests, and increasing economic openness. Russian-Chinese interaction is central to the emergence of an independent Eurasian pole of strength and constitutes its support base. Not accidentally, Eurasia became one of the most popular topics in Russian foreign policy and foreign economic expert analysis, meriting dozens of media articles and research papers in recent months. The most important of these is the big Valdai report entitled “Toward the Great Ocean-3: Creating Central Eurasia.” On the other hand, the fear that these developments and decisions instilled in the Western expert community was unusual, even against the backdrop of the general over-excitement in the last couple of years. The strategic objective in regional multilateral cooperation is to turn Eurasia in a zone for co-development that would be no less intensive than what exists between EU countries in Europe. Currently we can speak about the emergence of a “Eurasian moment,”a unique confluence of international political and economic circumstances that will make it possible to implement the cooperation and co-development potential of states in this macro-region. The “conjugation” concept originated in early 2015 from awareness that Russia could no longer – nor should – look at Eurasia as its “backyard;” one that must be guarded, but not necessarily developed. Being hermetic and peripheral provokes outside forces into trying to destabilize the outskirts of Russia and China, to drive a wedge between Moscow and Beijing, or to force other Eurasian states to make a choice between what is alleged to be mutually exclusive alternatives. Moreover, none of the contradictions between the leading Eurasian states that are discussed by political and academic circles can be called objective. Siberia, Kazakhstan, Central Asia, and China’s western provinces form the natural center of Eurasia. The main motivating forces of Eurasia’s transformation into a co-development macro-region are potentially the most promising and mutually complementary projects of interstates and trans-border cooperation: Eurasian economic integration and large-scale partnership within the framework of the Silk Road Economic Belt as suggested by China in 2013. The Eurasian integration and its institutional shell – the Eurasian Economic Union (EAEU) launched on January 1, 2015 – will help form the legal framework necessary for a joint leap forward, allowing the EAEU to emerge as an effective tool for preventing and solving interstate disputes. Moreover, Kazakhstan’s and Kyrgyzstan’s EAEU membership creates a situation where there is just one customs border between China and the EU market. A common customs and tariff space gives the Eurasian co-development project certain undeniable advantages, as Yevgeny Vinokurov and Taras Tsukarev from the Center for Integration Studies of the Eurasian Development Bank stated on the Valdai website. While the EAEU shapes the legal framework for a transport and logistic infrastructure and joint development, the Silk Road Economic Belt (SREB) will give it a huge trade and investment impetus. China’s record in creating inner economic belts will come in handy as efforts to organize new international and transcontinental economic belts capable of pooling resources, means of production and markets come under way. In an environment where Russia has entered a prolonged period of poor relations with the USA and its allies, it is interested in ensuring that opportunities for its development are minimally dependent on the West. Russia needs to promote the Eurasian integration project and open it to new members. It is in its interests to create regional development institutions that would complement the existing international financial and economic institutions and to remove military challenges and threats along its southeastern perimeter, particularly in the region of Kazakhstan and Central Asia. One of Russia’s crucial national objectives is to sustain a course for boosting the economic and political importance of Siberia and the Russian Far East and to create conditions for making its strategic partnership with China irreversible. China’s has a direct interest in building a system of international trade, economic and political cooperation in Eurasia, that would secure a transport corridor between the PRC and European markets, and be relatively independent of the traditional maritime routes; create favorable political conditions for implementing investment projects in Kazakhstan, Central Asia, Siberia, and in the Russian Far East; minimize the risks and threats posed by Islamic extremism; and optimize efforts to develop western China, one of the strategic objectives confronting the state. The region’s transport and logistic potential and the Eurasian co-development potential are huge indeed, especially considering the plans for creating trans-border investment clusters and priority development regions. The Eurasian economic belt is potentially cost efficient as well. It is not by chance that expanding the transport and logistic infrastructure is the key prerequisite and development vector in Central Eurasia. Implementing the SREB will make it possible to reduce cargo transportation distances on par with those realized by utilizing the Suez Canal route. The corridor is 8.4 thousand kilometers long, of which 3.4 thousand kilometers has been built in China and 2.8 thousand and 2.2 thousand kilometers are being built or modernized in Kazakhstan and Russia, respectively. An important advantage in this respect is that there is just one customs border – that between China and Kazakhstan – to be crossed. But there are problems as well. 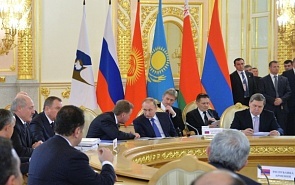 Differences have surfaced in the approaches of certain EAEU countries. Some of Kazakhstan’s representatives, for example, believe that they can do without their EAEU allies and channel all Chinese investments in their country maximizing transit benefits. Local experts say it is impossible to develop a single EAEU strategy towards conjugating the Eurasian integration and the Silk Road. None of the post-Soviet states has a chance for truly equitable relations with other partners aside from Russia. The EU can only offer a humiliating “integration without membership.” The great China will send in workers and build roads to ship out energy resources, but it will not protect them from external threats, let alone offer an equitable market regulation system, because it will never be able to forego even a modicum of its sovereignty. Meanwhile it is Kazakhstan that could head the mapping out of the transport component of the EAEU-Silk Road conjugation project. It is another matter that Russia itself may inadvertently lose the eastern wind its sails caught in the spring. To tell the truth, inefficient interagency implementation can negate even the most brilliant diplomatic achievements. A purely bilateral approach to relations with China and its consideration outside the context of Eurasian or Asian cooperation may prove an insufficiently advantageous strategy. The Shanghai Cooperation Organization that includes Kazakhstan, China, Kyrgyzstan, Russia, Tajikistan and Uzbekistan is a separate story. The SCO has covered a lot of ground since its inception. Originally many saw it as a mechanism for coordinating Russian and Chinese interests in their “common neighborhood.” Simultaneously the member states sought to promote cooperation in new areas, like economic matters, countering terrorism, and politics. Occasionally the SCO – by analogy with BRICS – stepped forward to formulate alternative (non-Western) approaches to the world order. Today, however, the organization has reached a crossroad, upon the crossing of which it will either slump into stagnation or acquire a new quality as Eurasia’s main international and political platform, as Alexander Lukin convincingly stated on the Valdai website. The threats are quite serious. The recent decision to establish direct relations between the Eurasian Union and China (on the basis of a partnership and cooperation treaty) can deprive the SCO of its economic component. The expected, albeit uncertain, accession of India and Pakistan carries the risk of reducing the degree of SCO political unity. China is somewhat tired of the SCO’s frequent lack of enthusiasm for its economic initiatives and has begun going it alone by setting up powerful financial institutions like an Asian Infrastructure Investment Bank. The SCO’s gradual fading away must be avoided as it is in the common interests of both Russia and China, and the Central Asian states that are aware of all the risks of political loneliness, particularly in the face of an iron-clad opponent in the West. If we want the Shanghai group to energize regional cooperation and development, it should be faced with strategic missions. It is necessary to offer SCO membership to other players: Mongolia, India, Afghanistan, Pakistan and even Korea. For Russia, a new international group under the SCO umbrella would mean the most important thing the country needs now – the deliverance from an age-old curse of having to choose between East and West. But it will not retreat into self-isolation and will cooperate with the ideologically close, important and rising regional partners. Russia may find its identity in an emerging world of regional groups through equitable cooperation rather than through confrontation and fencing itself off. Of course, it will have to cast a fresh glance at certain established international political clichés, primarily getting rid of its patronizing attitude toward the majority of Eurasian partner nations. Simultaneously, high on the agenda is the emergence of a new quality of relations with Iran. After a breakthrough on the Iranian nuclear program, that country is increasingly active in different formats. Iran is a major Eurasian power and an important trade and economic partner for China (and potentially for Russia and other EAEU countries). To make confident progress in this regard, it is necessary to carefully consider all possible options and ways of cooperation, like preparing a preferential or non-preferential trade agreement, establishing a free trade area, or – why not! – encouraging Iranian accession to the Eurasian Union. And, finally, for Russia itself the Eurasian vector and choice are important for an added reason: the incipient revitalization, albeit on a new basis, of relations with the European Union. The 2013−2015 military and political crises in Europe and the subsequent freezing of actually all relations between Russia and the EU (including suspension of all talks and dialogues) give us a unique opportunity to start these relations from scratch and on the basis of an integrated Russian strategy/concept with regard to the EU. Earlier this was impossible, because at stage one (the early 1990s − the early 2000s) Russia lacked an independent stance on this issue or experience in dealing with the EU. After 2003, the national policy in this area amounted to “correcting mistakes” committed in the earlier period. Today is the most fortuitous juncture for taking stock of Russia’s real, not imposed, interests in relations with the EU. This means primarily the establishment of direct contacts between the EAEU and the EU and the latter’s recognition of Eurasian integration; it’s the promotion of energy cooperation; it’s the discussion of free movement, and other issues. Most importantly, is that all these issues should be based on Russia’s views and preferences rather than on something interpreted from a vague understanding of Brussels instructions or “Europocentric” models. For far too long we tried to adjust Russian approaches to the (rather limited) EU capabilities. Now we have a chance to make an entire model of relations inherently equitable. The new EU neighborhood policy will be aimed at “stabilizing the geopolitical environment” rather than at transforming their neighbors. Europe needs peace and calm on its borders in order to attend to its inner problems and digest acquisitions of the recent years. For this reason, the EU will be sufficiently open within the next few years to perceiving ideas and proposals from external partners. Simultaneously, we mustn’t allow a slide back into the old rut, business as usual, meaning the former quite ambiguous cooperation model, where sides actively cooperated on a technical level, while having no clearly articulated strategic vision. The progressive dynamics in Russian-Chinese relations, Eurasian integration, and Russia’s “pivot to the East” are factors that are clearly encouraging the Europeans to intensify their dialogue with Russia. As a powerful Eurasian player Russia will only be stronger in shaping new strategic relations with its traditional partners in the West. And conversely, only more stable relations with Europe will relieve us of unnecessary problems as we build a new Eurasian house for all inhabitants of our great continent. It is this that should become the national foreign policy priority for 2016.